* Deleted scenes: over 20 minutes!
! Scarface scorecard: watch Scarface like never before. Keep track of the number of times the "F" word is used and monitor the bullets fired!
! Making of Scarface - The video game: immerse yourself in the world of Scarface in this behind-the-scenes look at the creation of the video game.
! 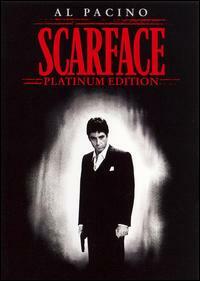 The rebirth: director Brian De Palma, Al Pacino, producer Martin Bregman and screenwriter Oliver Stone examine the history of Scarface from the original 1932 classic to the shooting script.